ww2dbaseGiovanni "John" Basilone was born in Buffalo, New York, United States. Between 1934 and 1937, he was an enlisted man in the United States Army based in the Philippine Islands, and upon his return he picked up the nickname "Manila John". He enlisted in the United States Marine Corps in 1940. In 1942, he was sent to Guadalcanal in the Solomon Islands, where he made himself known as a fearless warrior at Henderson Field during a Japanese counterattack led by Major Generals Kawaguchi and Nasu. Leading a weapons company of the First Battalion of the 7th Marine Regiment, 1st Marine Division, he was equipped with a 100-pound Browning heavy machine gun. He carried the heavy gun for 30 yards to set up a strongpoint so that the other two guns nearby, both jammed, could have time to recover and reload. "Basilone had a machine gun on the go for three days and nights without sleep, rest or food," fellow Marine Nash Phillips remembered (and exaggerated, as the Japanese attack did not last nearly as long). By the time the Japanese attack ceased, the three Browning guns had used up 125 belts of ammunition, with only one to spare. For his personal valor at Guadalcanal, he was awarded the Medal of Honor by General Vandegrift in May 1943.
ww2dbaseOn D-Day just beyond the landing beach designated "Red Beach II" at Iwo Jima, Basilone tried to lead a rifle unit to take out a Japanese gun emplacement. "Come on, you guys, we gotta get these guns off the beach", he yelled, as recalled by others who survived. A few seconds later, out of nowhere, a mortar shell landed near him and struck him down. 4 Nov 1916 John Basilone was born in Buffalo, New York, United States. 3 Sep 1943 John Basilone arrived in New York, New York, United States. 6 Sep 1943 John Basilone began a bond tour in the New York City region of the United States. 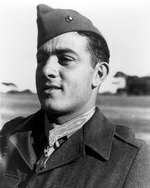 9 Sep 1943 John Basilone participated in a bond tour event in Newark, New Jersey, United States. 10 Sep 1943 John Basilone participated in a bond tour event in Jersey City, New Jersey, United States. 18 Sep 1943 John Basilone participated in a bond tour event in Scanton, Pennsylvania, United States. 19 Sep 1943 John Basilone participated in a bond tour event in his home town of Raritan and the neighboring town of Somerville in New Jersey, United States. 6 Dec 1943 John Basilone arrived in New York, New York, United States and prepared for the bond drive event that was to take place on the following day, which was the anniversary of the Pearl Harbor attack. 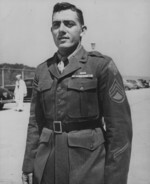 27 Dec 1943 John Basilone departed for Camp Pendleton, California, United States. 13 Jan 1944 John Basilone was assigned to the 21st Infantry Regiment of the newly formed but not yet activated US 5th Marine Division. 3 Jul 1944 John Basilone re-enlisted in the United States Marine Corps. 7 Jul 1944 John Basilone and Lena Mae Riggi completed the application for a marriage certificate. 10 Jul 1944 John Basilone married Sergeant Lena Mae Riggi at St. Mary's Star of the Sea Church in Oceanside, California, United States. 19 Feb 1945 John Basilone passed away. I wish I could have meet Mr. Basilone. What a fine man. Uuuuh RAH. One of the greatest American heroes ever. one of the best military personel in world history thank him for his services. GySgt Basilone's accomplishments were a major part of the Ken Burns documentry, The Pacific. It is a strong statement when a US Navy ship, a bridge, and a highway are named after you. Plus a statue of you in your home town. No offense to Mr. Basilone, but, he didn't pass away, he was killed by a mortar. My Father G B Mason is still alive and did serve in Basilones platoon. Yes, there are not many of the great men left.